We had a great time visiting Wales last year, checking out the beautiful countryside, the castles and the mountains, but one place caught our attention. We’re talking about the Pontcysyllte aqueduct in north east Wales, close to the English border. 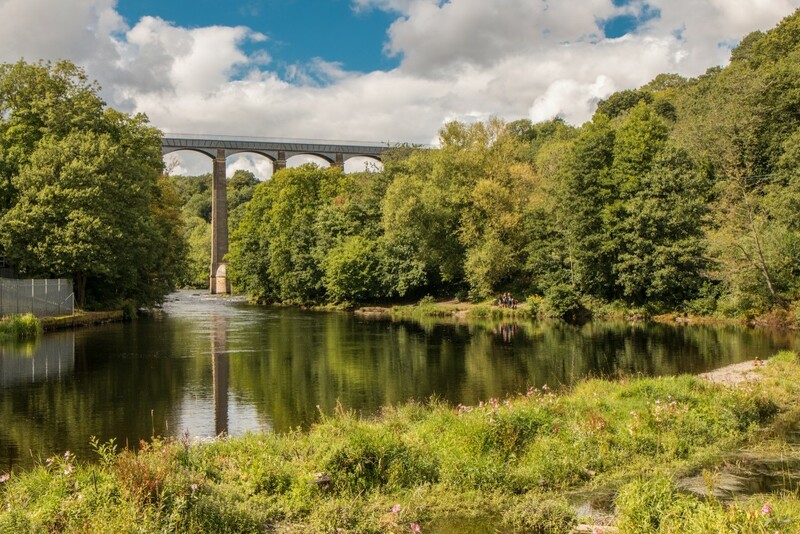 Pontcysyllte aqueduct is known as the “stream in the sky” and it’s not your average aqueduct, it was built over 200 years in 1805 to carry the Llangollen canal over River Dee and its valley between Trevor and Froncysyllte. 18 pillars support the aqueduct, which stands over 30 m high. The amazing thing is that Pontcysyllte is navigable and you can still cross it by boat and also on foot. Just mind your fear of heights! 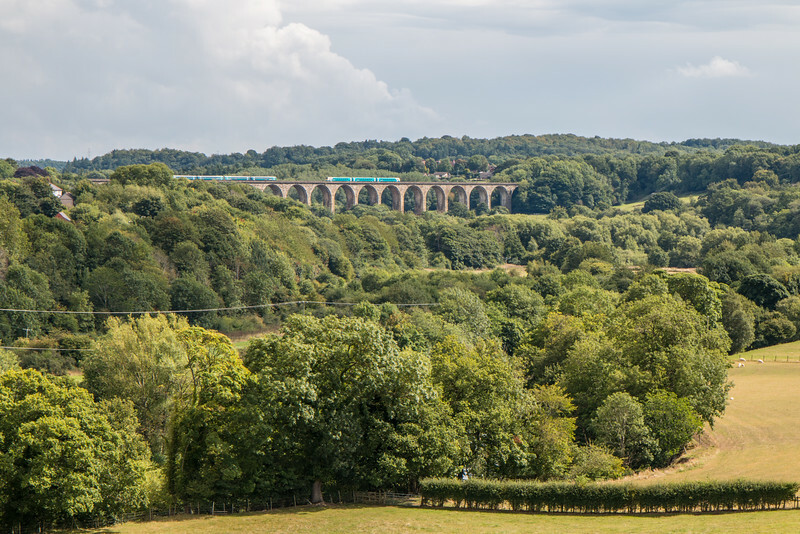 The aqueduct is a masterpiece created by Thomas Telford and is widely considered a feat of civil engineering. Due to its importance, it was selected as a UNESCO World Heritage Site. We started our visit in Trevor, on the north side of the aqueduct, where some of the classic canal boats are docked. 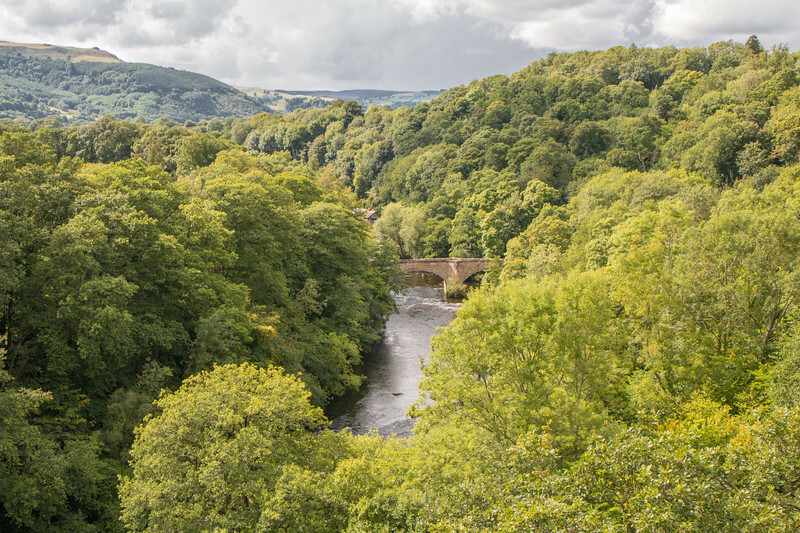 The setting of Pontcysyllte is stunning, no doubts about it. A lush green valley where the aqueduct fits perfectly. After checking out the boats, we went to get a closer look at the aqueduct and saw the first boats crossing it. It really is incredible! 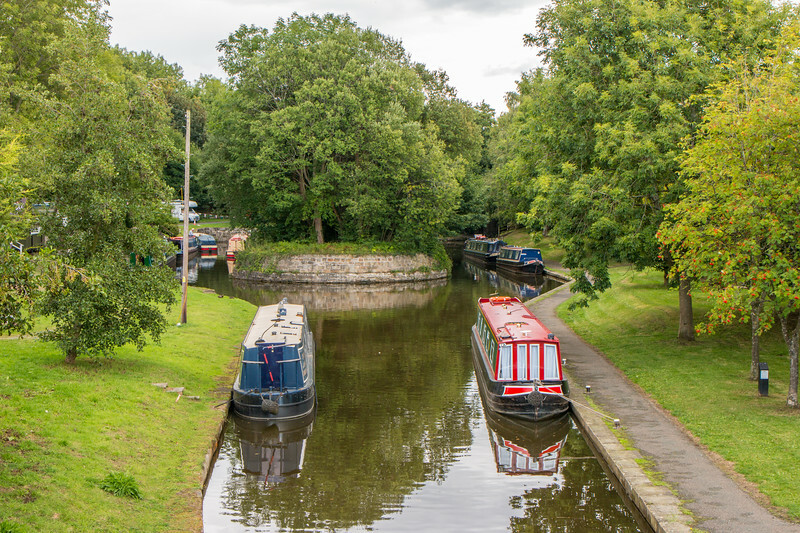 If you’ve been to other canals in the United Kingdom, you’ll easily recognize these boats. You can see them, for example, in London. 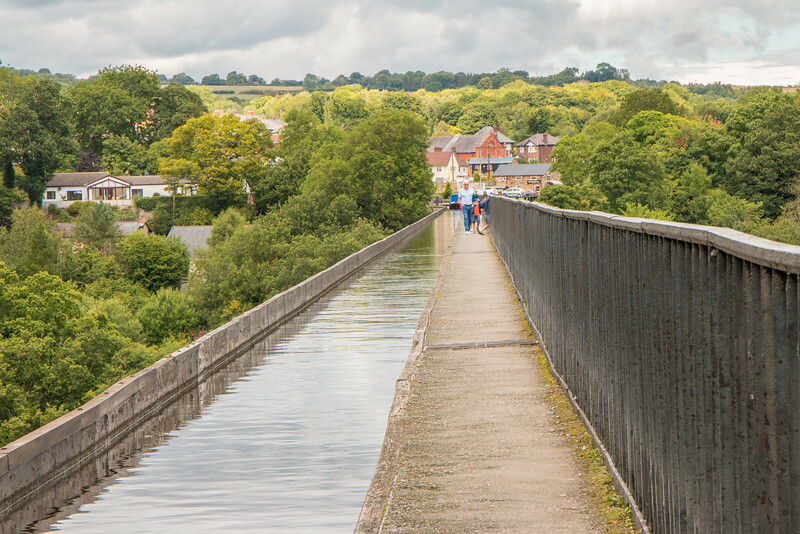 The Pontcysyllte aqueduct is 300 m long and besides crossing by boat you can also do it on foot. Sounds simple, the only problem is the fear of heights on one side and the water of the canal on the other. We faced our fears and crossed it slowly. We must say crossing the aqueduct is the only proper way to experience it. Once midway through, the views over the Dee river and valley open up and it gets even better! We were quite lucky to have a sunny day to visit Pontcysyllte. Unfortunately, we didn’t manage to cross the Pontcysyllte aqueduct by boat, but doing it on foot was already quite an experience. If you have the time, boat tours are available on the canal. 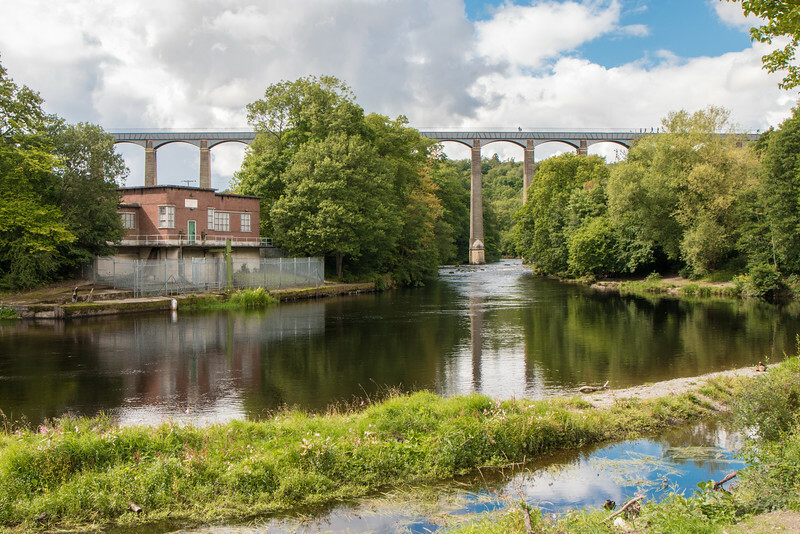 After crossing the aqueduct from above, it’s also a good idea to go down to the bank of River Dee and walk alongside it for a different perspective. Starting from the North end of the aqueduct, walking trails are available to both sides of the river. 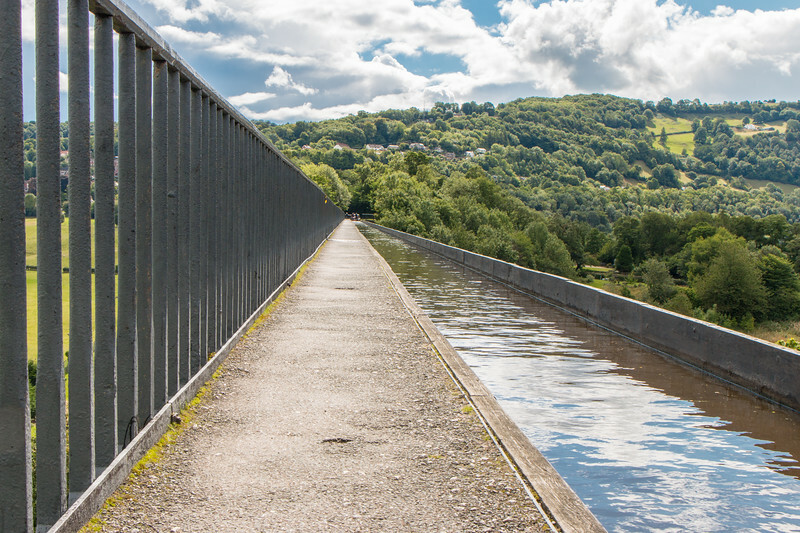 It only takes about 10 minutes to reach a section of the bank that is far enough for one to get a better sense of the amazing feat that was building the Pontcysyllte aqueduct. And as for the boats crossing the aqueduct, it looks like they’re flying! This next photo was taken from the eastern side, whilst on the west side, there’s a similar view from the old bridge on gate road. It’s easy to get to Pontcysyllte aqueduct. We traveled by car and it seems that most people do so. Short and long term parking is available and signaled. When we visited, there was barely anyone around and we parked easily on the north side of the aqueduct. Public transport alternatives include buses and trains. Local buses serve the area from Llangollen and Wrexham. Chirk and Ruabon are the closest train stations. Liverpool and Manchester airports are under an hour away from Pontcysyllte aqueduct. We found this place to be really interesting and truly worth visiting. 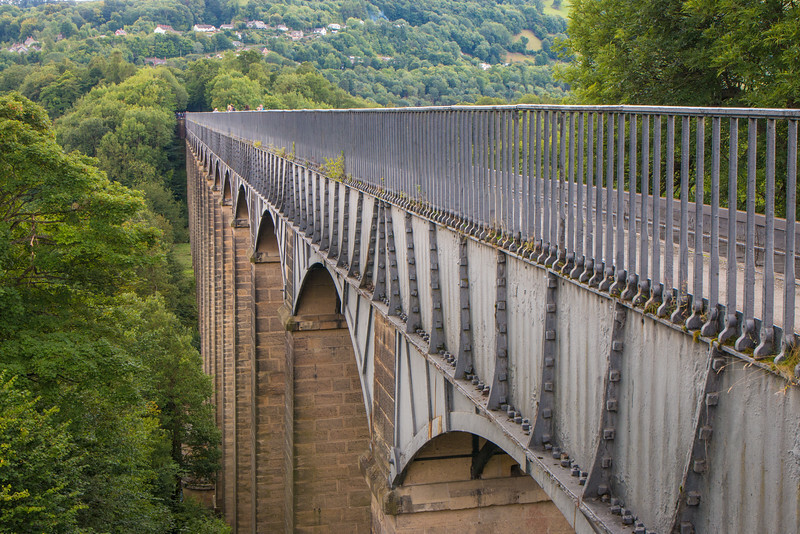 It’s incredible how structures like Pontcysyllte were built and how they still amaze us to this day. If you’re looking for something different to do in Wales, don’t miss this place. 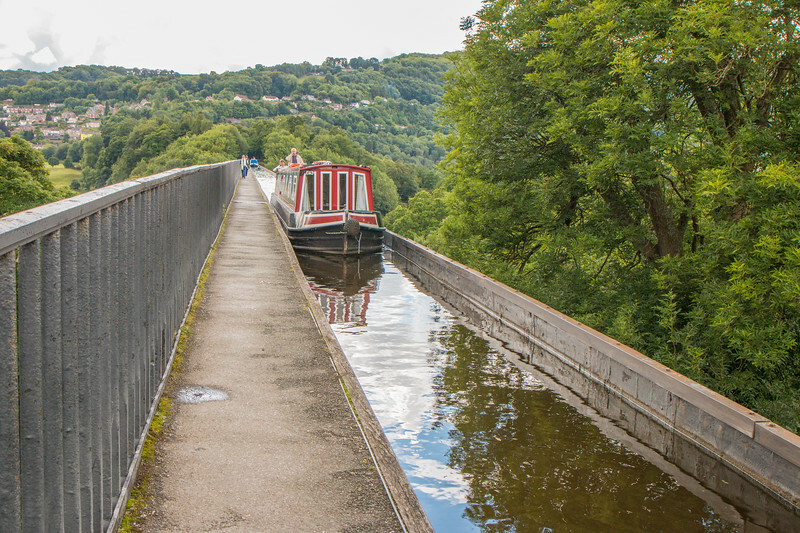 Have you visited Pontcysyllte aqueduct? I have never been to Wales (my hubby has) and definitely want to go. 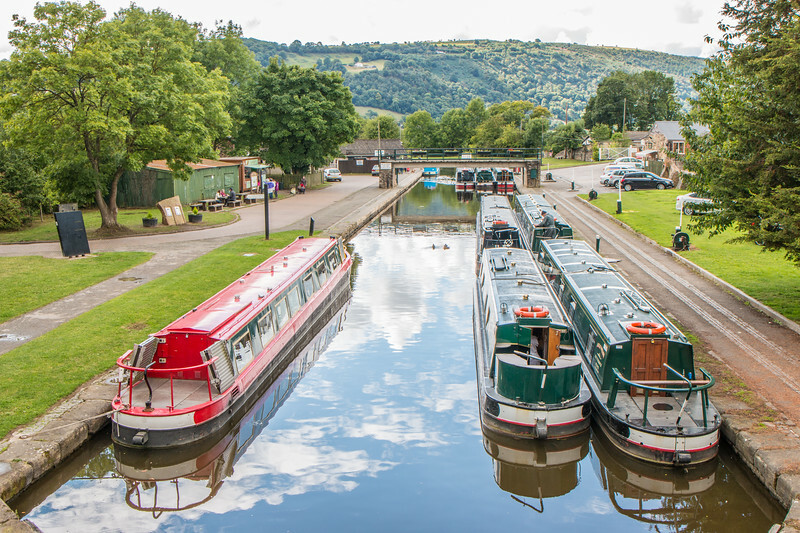 We lived in France and I loved the canals there so I love the idea of visiting them in Wales also. I love walking along the water. 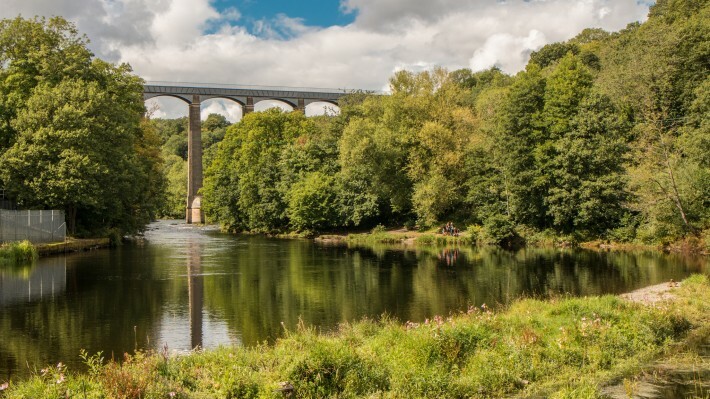 I have never heard of Pontcysyllte, but it is going on my list! Wales is a lovely place to visit. We spent a few days there and it’s totally worth going there. Plenty of interesting places to visit, just like this one. 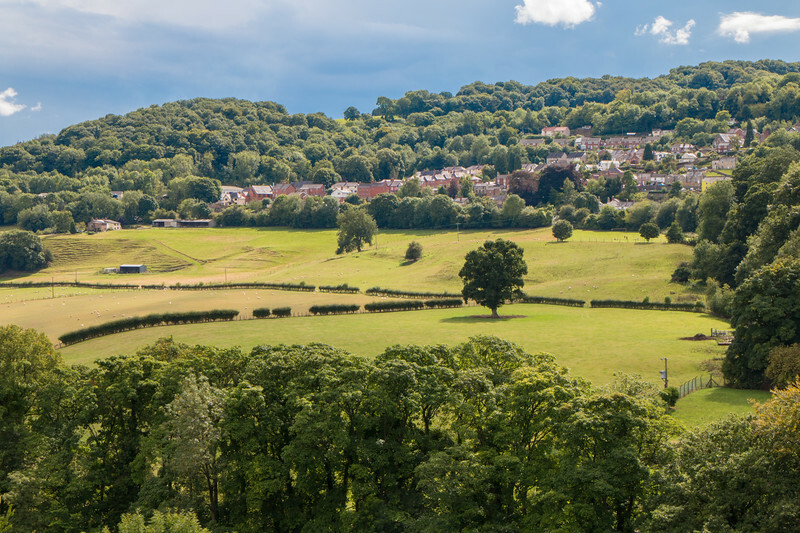 Those views are amazing – your photography is awesome, and really brings the area to life. Awesome. I am so charmed by this idea of a boat trip across an aqueduct. Beautiful countryside to view. Thanks for introducing this to me! It’s a unique place for sure! I’ve never heard of this place…and I don’t even think I know how to pronounce it. I love finding out about new places I have never heard of before. Especially if it’s anything as beautiful as you described! Thanks for instilling inspiration! Pronouncing it is a bit tricky! Cheers, Erica. I have never visited Pontcysyllte aqueduct, I would definitely make this a place to visit in my bucket list! I didn’t know about the aqueduct but that looks absolutely beautiful! I’d love to take that trip someday. Thanks for sharing. I knew this looked familiar, it was on The Amazing Race a few years ago! Such a unique place. I would love to explore the aqueduct by boat. Those little boats are adorable! I’d never heard of the Pontcysyllte aqueduct, but I’d love to visit. Crossing the aqueduct looks like such a fun adventure, and the surrounding scenery is gorgeous! It’s quite a nice place! wow, all the shared images are really nice. I have explored this place after mine Eagle Lake tour. I had a awesome time therea nd enjoy having fun. In this place you can see many new things. What a lovely site! The colours are so vivid I am so jealous on how you edit your photos. Never heard about this place but it’s good to learn something new!